Okay, so there are probably better ways to get your customers to notice you than that - but hey, it was (fairly) original at least! In this week's Business Class Monday video, I'm chatting about the different ways that you can actually make an impression with your ideal customers once you've found them. Those first 2 stages are the easy part (although they often don't feel that way I know!) - but you can do it all from the safety of your little bubble. You're not having to put yourself out there or be vulnerable. You're just watching from afar. You know what you've got to offer and you know how it will impact the lives of your ideal customers. But so far, THEY don't know - and they won't know unless you make your move. It's time to let the world (or at least your ideal customers) know who your are and how you can serve them. It's time for THEM to notice YOU. 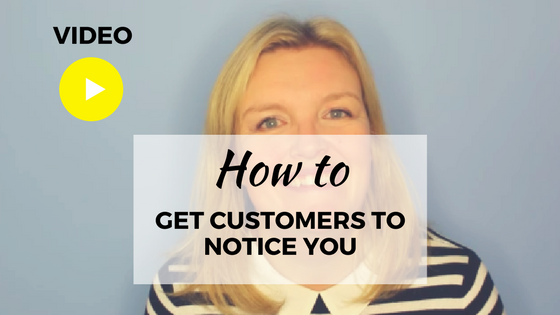 This week, I'll share my '2 C's' of getting noticed by your ideal customers. It may feel scary at first but focus on THEM, on the benefit they'll get from experiencing you and your business and then DO IT. PSSST! If you sign up now, on the next page I'll tell you the 4 biggest mistakes that I see new online business owners make... so you don't have to!